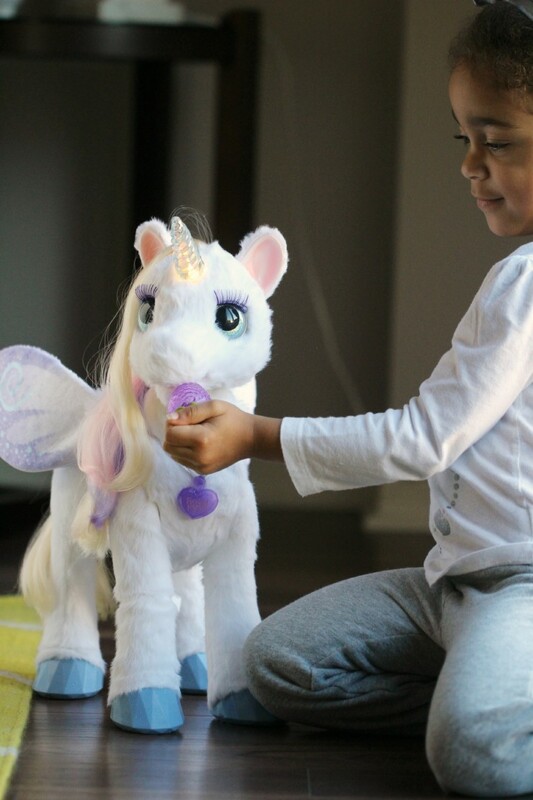 FurReal Friends - StarLily: My Magical Unicorn Pet #FMEGifts2015 - Frugal Mom Eh! My childhood best friend and I were literally obsessed with unicorns. We spent a lot of time drawing unicorns, playing with our favourite My Little Ponies – always the unicorns and watching The Last Unicorn, over and over. 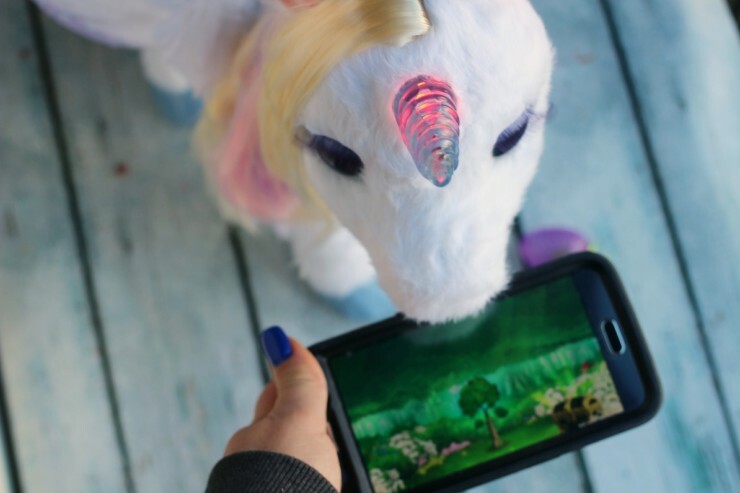 It’s pretty safe to say I would have gone crazy for the latest addition to the FurReal Friends line-up – StarLily: My Magical Unicorn Pet. I think it goes without saying that this is one toy that is going to be on many lists to Santa this year! 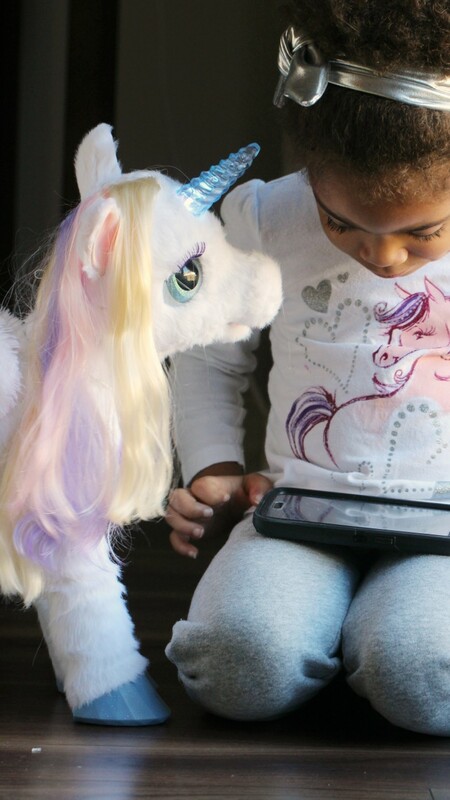 StarLily is basically a dream come true for any child who loves unicorns. I will start with the stuff that was “meh” as the list is very short. StarLily requires 4 “C” batteries that are not included. She does fall asleep pretty quickly which definitely saves on battery life and she wakes up easily either by touch or the wake-up button on her back. She also does not walk which confused Keira, 3, as she also has the Walking Go-go Puppy. That said, once she got over the confusion, it did not impact her enjoyment of StarLily as she just does so much other stuff. 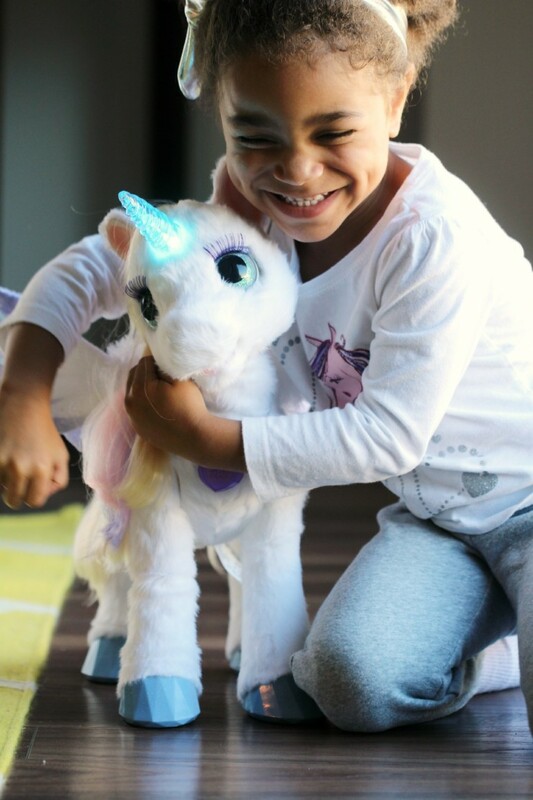 The good – she is a unicorn with a horn that lights up in different colours depending on her mood. She responds to sound and touch motion and sound and she is capable of over 100 combinations of responses. She is poseable – you can have her stand, sit or lay down. She is also able to lift one leg, move her head up, down and around plus she is able to flutter her sparkly wings. Her eyes feature gorgeous long eyelashes and she is able to blink! 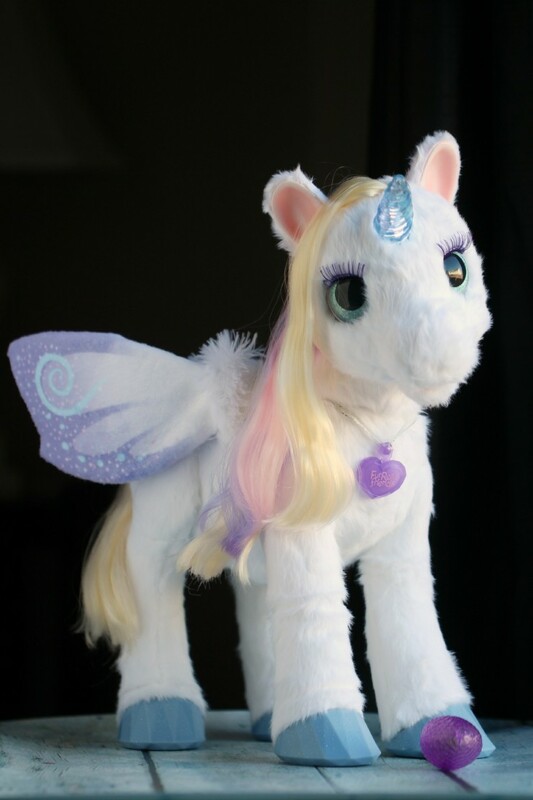 StarLily’s fur is very soft and her hair is long and brushable – Keira loves to practice hair styling on StarLily. All-in-all she is one beautiful, and endearing, toy! She comes with a Sugarberry treat for feeding, and when fed StarLily responds by making crunching noises. Most of the sounds we have heard so far are the crunching noises, “mmMMmm”, humming, music and neighing. She seems to respond by nuzzling and cooing or sighing when you touch her face. There is also a free StarLily app available in the GooglePlay Store and Apple Store. The app features several games and activities for little ones to play with StarLily that helps to increase her “powers” which in turn gets her to respond in new ways. One of the apps lets you grow fruit that StarLily “eats”, showing immediate appreciation of the treats. The games are progressive so as you explore through them you unlock mores games and adventures to take StarLily on. StarLily is recommended for ages 4 and up. That said while Keira definitely knows how to play properly with StarLily, my almost 2 year old loves to play with her too. She adores feeding her, gently petting her and of course all the reactions she gets from playing with her. 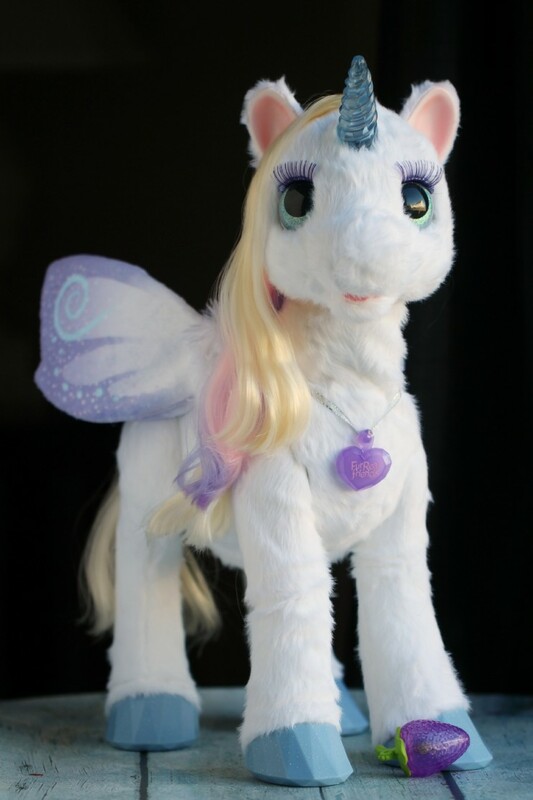 StarLily is definitely more costly than other FurReal friends but she is also the highest quality from the line-up that we have seen. I do think she is absolutely worth every penny based on all the hours of interactive play she has seen so far. 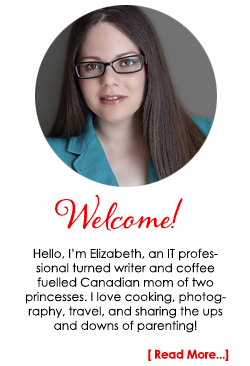 She is definitely a great option if you are looking for a way to introduce a little magic into your child’s life – and she is sure to impress! You can purchase StarLily online from Amazon, Sears, Walmart and Toys ‘R Us and she can also be found at a store near you. that is so stinking cute! I have a daughter that would be all over this unicorn! She loves them! She is just adorable. I really like the size of her. I think my 8 year old niece would really like her. 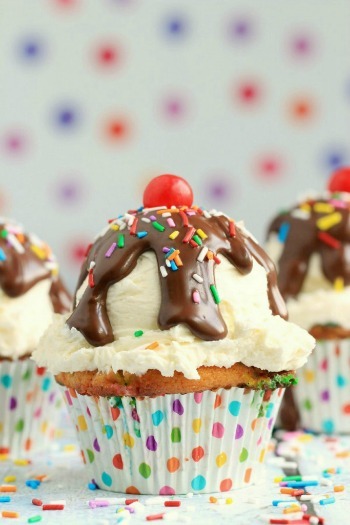 What an adorable unicorn. Any little girl would love to have her. She looks so soft. Not gonna lie, I want this for me! The kids would play with it I’m sure but man I’ve always wanted a unicorn! Wow, Furreal friends have come a long way! I just love how big and cuddle ready Starlily is. I bet my niece would have a blast with the interactive app! 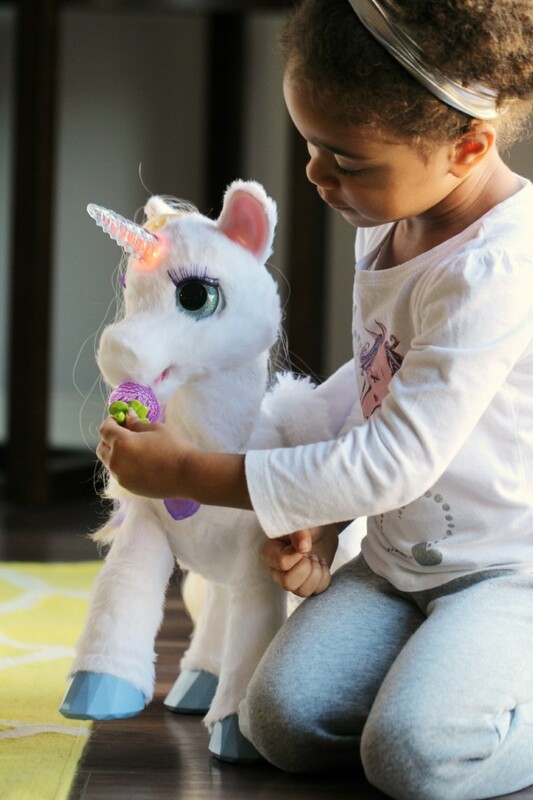 My daughter is obsessed with unicorns! This is definitely going to be on her Christmas list. What a cute toy. I love unicorns. Oh how cute! My daughter would absolutely love to have one of these! She loves unicorns! 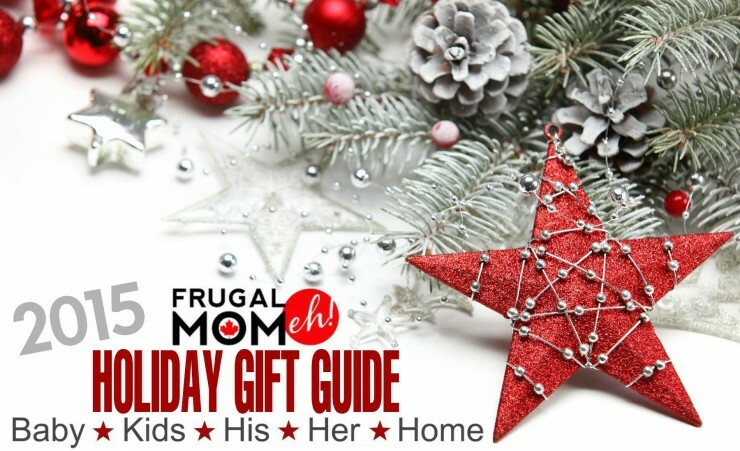 This is super cute and something my girls asked for! 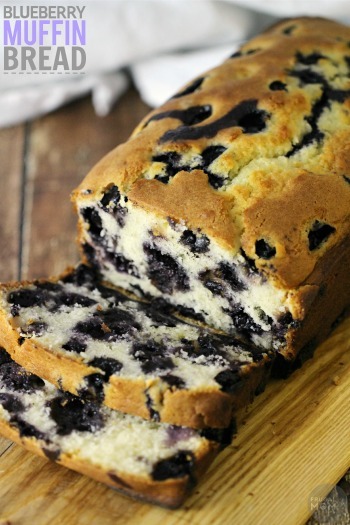 I love that it looks so soft and has cute eyes! Oh how cute is that? 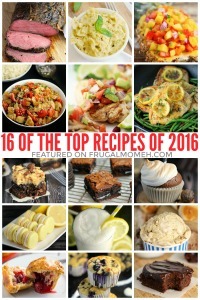 My daughter would just love this for Christmas! My friends little girl just got this FurReal friend. She loves it. 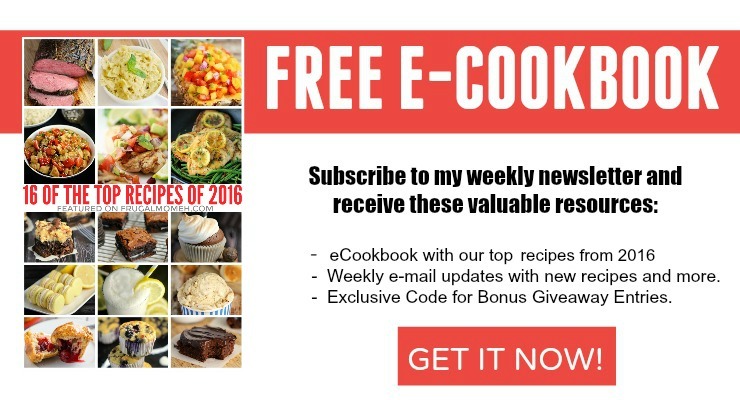 It is a great idea for a Christmas gift. 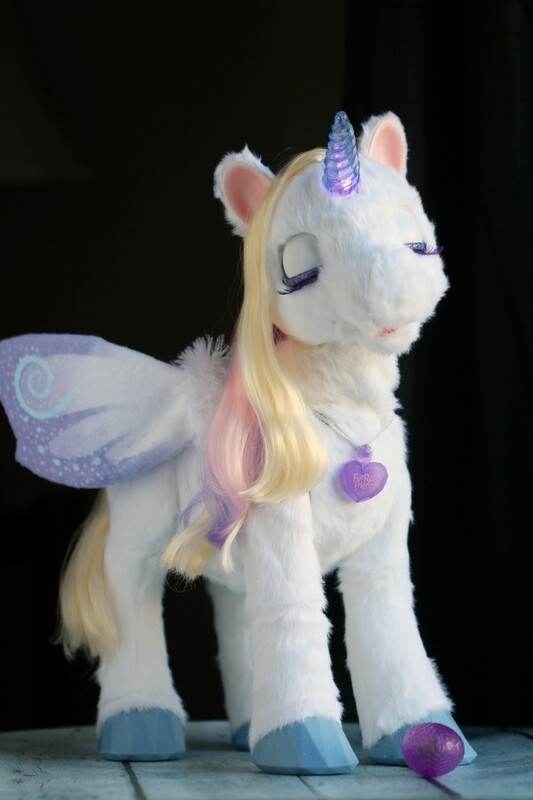 What a cute unicorn,my little girl would love to have her. I think my daughter would love this! It looks like such a great toy. My daughter is the same way. She loves My Little Pony and The Last Unicorn. She would love this! How super cute! I bet my daughter would so love this!